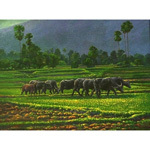 Artist Tan Waphet paints a rural scene with oil on canvas. "Rice planting has been part of my world since my youngest days and it is in my blood. 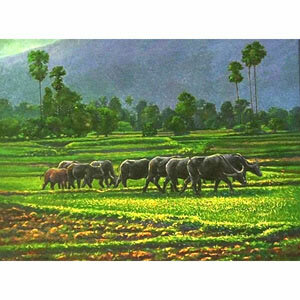 Buffalos play a central role in traditional rice planting. We keep them for the hard work of turning the soil to prepare it for planting. 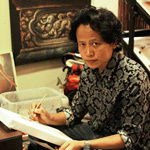 For me, they are like friends that I always enjoy seeing around," says the artist.